Let me share the numbers with you. Here's a pic of my recent Twitter impressions. Does that mean 18,000 plus people saw my tweets? No, that's not how this works. An impression on the internet is the potential number of viewers. In other words, that many people could have seen them. My tweets showed up on people's screens 18,000 or so times. And that's just one of my Twitter accounts. There's a few other accounts sending out tweets. 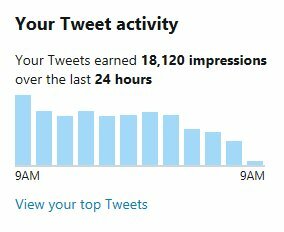 I didn't bother gathering a total number of impressions. Let's just say it's a lot of potential eyeballs. The next number puts it into perspective. Clicked on about 700 times. Because website traffic is really low right now. Does that mean I'm guaranteeing sales? Because of what I put out on Twitter. I get them to walk into the store. That's a little beyond my control. But the point is they see your page. I keep my prices rock bottom cheap. Check out this page for more detail.